» Manning Headed to Denver! Now What? Congratulations, Denver Broncos. Your organization appears to have won the Peyton Manning sweepstakes. Now what? First, the Broncos have to negotiate a deal with Manning. The terms being thrown around are five years and $95 million, but this is a contract where the specifics are pretty important. Manning’s going to get some ridiculous amount of guaranteed money — perhaps even the $55 million figure that’s been thrown around after the Mario Williams deal — but the Broncos need to ensure that they get the right wording in the contract to void it if Manning’s neck injury precludes him from playing. It seems simple enough to get that done, but it’s a non-trivial discussion. Denver has a young, cheap team with the salary cap space to fit Manning into their budget, so the financial issue shouldn’t slow down this deal very much. Next is adapting the roster to take advantage of Manning’s presence. He takes over an offense that averaged just 19.3 points per game, which was 25th in the league. Denver’s offense really only had two strengths last season: A running game that ripped off significant gains on a regular basis, and a passing game that avoided interceptions. Most of that was attributed to Tim Tebow. Research has shown that teams with running quarterbacks like Tebow or Michael Vick improve their halfbacks’ yards per carry and effectiveness when the run-happy quarterbacks are in the lineup, and then see that same performance disappear when the rushing quarterbacks get injured or go back to the bench. That also stands for Willis McGahee, who averaged 3.8 yards per carry in the games before Tebow entered the lineup at quarterback and 5.2 yards a pop afterward. Denver’s running game will be worse with Manning in the lineup, but they should make up for it by significantly improving their passing attack. Of course, Manning needs weapons to throw to. Denver’s top receiver is Demaryius Thomas, the 2010 first-rounder out of Georgia Tech who had that monster playoff game against the Steelers. Thomas is a better fit, though, for the Tebow-style passing attack than for a Manning-led offense. How is that possible? His strengths match up with Tebow’s. Tebow was far below average at hitting receivers on timing routes and throwing short underneath passes, but he was actually above-average at lofting passes downfield into places where his receivers could make plays. The 6-foot-3 Thomas isn’t a great route runner, but he has impressive athleticism and was able to make plays against smaller cornerbacks on jump balls and contestable passes. He’ll need to improve his route running to be Manning’s top target. I suspect that Manning will probably make more use of Eric Decker, who could be in line for an 80- to 85-catch season. The Broncos will want to add another wideout to that group, but the cupboard has been picked dry by free agency. Would they consider making a huge offer to Mike Wallace if it means giving him $13 million in his first year and giving the Steelers their first-round pick? If not, the best options on the market are guys like Deion Branch, Jerome Simpson, and Early Doucet. Manning may have to make do at wideout with the guys he’s inheriting. John Elway might also want to consider some old Colts favorites who know the Manning playbook to supplement the bottom half of the roster. Knowshon Moreno would be the ideal Manning-style back as a versatile running back and receiver, but the organization has greatly soured on him and might not want to keep him around after a torn ACL and a February DUI. In that case, they could opt for Joseph Addai or a smaller back like Justin Forsett to serve as the pass-catching complement to McGahee. They also will want a tight end who can flex out into the slot and beat zone coverage. That might suggest that the Broncos would target Dallas Clark, but it’s more likely that they would consider Clark’s backup, Jacob Tamme, who is also an unrestricted free agent. Tamme is six years younger than Clark and, after Clark’s many injuries, a better player right now. There is no room at the inn for longtime Colts center Jeff Saturday, who is now likely to retire. Even as they add Manning, the Broncos can’t afford to simply insert him into the lineup and start printing out 2012 AFC WEST CHAMPIONS T-shirts. This was an 8-8 team that had the point differential of a 5.8-win team last season. Manning is going to make them better — perhaps significantly better — but he’s not going to be enough to turn them into a championship-caliber team alone. Denver needs to be in on adding those offensive weapons for Manning and should consider targeting options to improve their limited secondary, especially at cornerback. Ironically, their best option across from Champ Bailey might be free agent Tracy Porter, who took a Manning interception to the house to seal Super Bowl XLIV. If they start with Andre’ Goodman out there, Manning might make it a mission to Roc Alexander him in practice. Adding a defensive tackle is also a priority after Brodrick Bunkley hit free agency and Ryan McBean got suspended. Re-signing Bunkley would be ideal. oh, Tebow? Hmmm. I suppose we should probably talk about him a bit, too. One of the many positive side effects of acquiring Peyton Manning is that the Broncos have an opportunity to sell high on Tebow without alienating parts of their fan base in the process. They could choose to keep Tebow on the roster as a backup, but it’s going to be extremely difficult to run a Manning-style offense and then adapt overnight to the Tebow-style attack from last season in the case that Manning gets injured. In addition, when you consider Tebow’s incredibly high rate of contact (both his 10.9 percent sack rate, which led the league, and the hits he takes on running plays), the Florida star has to be an injury risk going forward. He stayed healthy during the regular season, but got hurt during the playoff loss to the Patriots and would have missed the AFC championship game if the Broncos had made it. There aren’t going to be many suitors for Tebow. The Broncos are basically looking at Statue of Liberty teams for him; the tired, the poor, the huddled masses. Only three teams would really have an obvious interest in acquiring Tebow, and two of them play in Florida and would want him mostly for his ability to sell tickets. The Jacksonville Jaguars should be considered the prohibitive favorites to acquire Tim Tebow. No other situation in the league makes anywhere near as much sense. The word we’ve tossed around with regard to the Jags is “moribund,” and while it’s probably a little harsh, it’s not that far off. The Jaguars have Blaine Gabbert under center, who just finished one of the worst rookie seasons by a first-round pick in recent memory. They keep part of their stadium under tarps for each home game and have still struggled to sell out EverBank Field. They were also purchased last year by Shahid Khan, who has already said publicly that the Jaguars would have drafted Tebow if Khan had been around in 2010. Tebow’s a local legend in Jacksonville, having grown up in its suburbs and played college ball at Florida. Acquiring Tebow would take the tarps off and make his jersey the hottest-selling piece of fabric the NFL offers. It would also likely increase Maurice Jones-Drew’s effectiveness by virtue of Tebow’s ability as a runner. The only argument against Tebow is that general manager Gene Smith reportedly isn’t interested in the quarterback by virtue of the low-round grade the organization had on him heading into draft day. It doesn’t hold water. This is the same organization that passed on Laurent Robinson for free twice last year and just gave him $13 million in guaranteed money. This is the same organization that drafted Reggie Nelson in the first round of the 2007 draft and then dealt him, three years later, for abysmal replacement-level cornerback David Jones. They change their grades on players all the time, and even if Smith doesn’t want Tebow, Khan is likely to overrule him, just as Khan suggested he would have in 2010. Outside of Jacksonville, the only other suitors for Tebow that stand out would be the Dolphins and Browns, neither of whom have as compelling a case for him. Tebow wouldn’t be an upgrade on Matt Moore and the Browns appear to be more interested in Ryan Tannehill with their fourth overall selection. Both teams could use the shot in the arm of excitement that a Tebow acquisition would bring, but Jacksonville would likely outbid them in a sweepstakes. And while teams like the Patriots have been linked to acquiring Tebow as some kind of exotic weapon for a few snaps per game, because he’s not a traditional backup quarterback and doesn’t play special teams, it will be hard for a team to sign him and justify using an active roster spot on him most weeks. That makes his acquisition by those sorts of teams far less likely. What would Tebow bring back in a trade? Not much. At best, the biggest deal the Broncos could hope for would be the 39th overall pick possessed by the Jaguars, and even that seems unlikely in such a thin market. It seems far more likely that the Broncos will get a third-round pick and, perhaps, a conditional pick that would depend upon Tebow’s snap count and production in his new market. The rest of the league knows that the Broncos want nothing to do with Tebow and might use Denver’s lack of leverage to bring his price down, but he seems unlikely to hit free agency before somebody throws a pick or two Denver’s way. In the end, the Broncos simply had to take this risk. They clearly weren’t comfortable with Tim Tebow as their quarterback of the future, and the opportunity to get a quarterback as good as Peyton Manning in free agency is a once-in-a-decade chance. 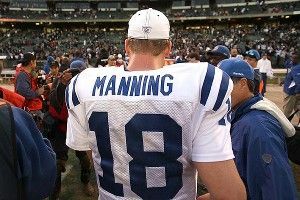 If Manning’s arm strength disappears as the season goes along and the experiment lasts one year before Peyton rides into the sunset, it was still worth trying. Replacing Tebow with even 90 percent of the 2010 Peyton Manning is the biggest single upgrade a team has made this offseason, and while it doesn’t make Denver a Super Bowl contender by itself, it does make them the favorites to win the AFC West for the second consecutive season.